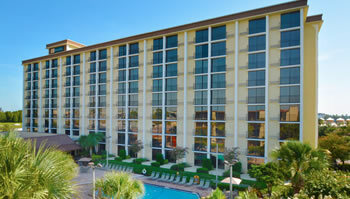 Rosen Inn is conveniently located on world-famous International Drive near Universal Orlando Resort™ and SeaWorld®. 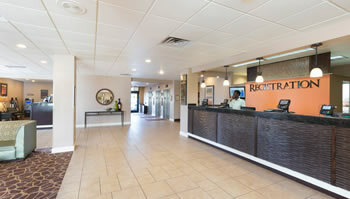 The hotel is within easy walking distance of hundreds of shops, stores, restaurants, and attractions. The location is close to Interstate 4 exits, the major local intersections of International Drive and Universal Boulevard, and International Drive and Kirkman Road. Scheduled Theme Park Transportation: Provided based on regular park operating hours* (does not run continuously) to Universal Orlando™ theme parks, SeaWorld Orlando®, and Aquatica® via the Super Star Shuttle. Seating/standing space is limited and on a first come, first served basis. Reservations are required and must be made in person at the Universal Partner Hotel Vacation Planning Center located in the hotel lobby one day in advance and up to 30 minutes prior to departure. *Not valid for Special Events, Groups, or Early Park Admission. Scheduled Theme Park Transportation (ADA Guidelines): Scheduled transportation is provided based on regular park operating hours* (does not run continuously) to Universal Orlando™ theme parks, SeaWorld Orlando®, and Aquatica® via the Super Star Shuttle. Advance reservations are required and must be made in person at the Universal Partner Hotel Vacation Planning Center located in the hotel lobby 24 hours prior to departure. Space is limited—one mobility aid per departure. Reservations first come, first served. *Not valid for Special Events, Groups, or Early Park Admission. Airport shuttles are available through local transportation companies and can be arranged for a fee. Our on-site taxi provider All Rapid Transportation is widely recognized for their airport shuttle services. Contact them in advance of your arrival by calling (321) 624-5028. Orlando’s public transportation system, Lynx, provides transit to a number of local attractions throughout Central Florida. Hotel guests can find more information about Lynx schedules and fees on their website: Go Lynx. I-Ride Trolley also offers guests a cost-effective and convenient way to travel on International Drive. I-Ride Trolleys stop at most of the major points of interest including Pointe Orlando, Orlando Premium Outlets, and the Orange County Convention Center. View the I-Ride Trolley route and stops for more information. I-Ride Trolleys are less expensive than local taxis and a great way to see all that I-Drive has to offer.